Once one of my favorite apps. I “sold” so many of these to friends, I was so passionate about it. Now — it’s close to abandon-ware. Please please please bring it up to date and give it your attention. People did pay big for this one. And the content is extraordinary. But... people. I use this or its sister app, How to Cook Everything, almost daily, and have for years. Nothing else comes close. The app is beautifully designed and easy to use and the recipes are all excellent. I love this app, please update it! I love this app but t hasn't been updated since 2014 and it won't work with the next version of iOS. Please update it so I can keep using it! I love how it makes it so easy---and that I can have the ingredient list for any recipe with me all the time! A GO TO FOR SIMPLE GUIDELINES! 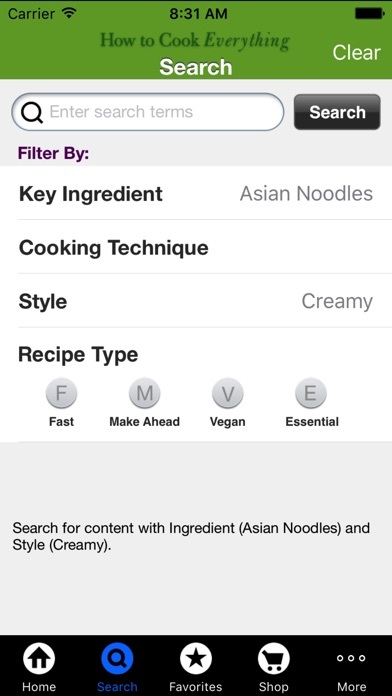 Makes quickly finding recipes and variations easy. Very handy for making a meal with ingredients at hand. Great app - just got it for a friend. Great Gift! I use this as my grocery list too. Love this app, use it almost daily! This app is the best cooking app I have used. It is very easy to navigate. I find myself browsing more often than I do with other apps. I enjoy Mark Bittman's articles in the New York Times and the narratives that accompanies the recipes in this app are just as enjoyable to read. This app woks great on its own or in conjunction with the marvelous book of the same title. I have found that my family really enjoys many of these recipes without ever thinking twice about it being healthy or vegetarian. I highly recommend this app. The print edition weighs as much as two bricks. This only weighs a few gazillion protons. 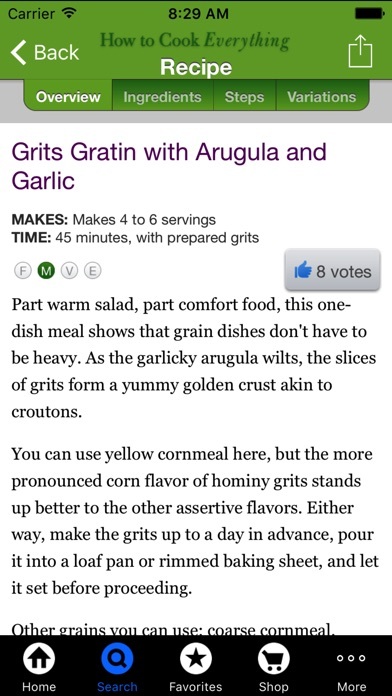 After trying dozens of these recipes for myself and finding what a joy they were, I gave this app to a friend. After four months she is still giving it rave reviews. Truly, this is a gift that keeps on giving – to both of us! Like a lot of the other reviewers I agree pictures would be nice. The other thing that would be helpful is a better way to search. A table of contents similar to a book would be nice. Right now the browsing is a little tough. A recipe box with categories for your favorites would also be helpful. And yes, more recipes would be nice. I really like this app but couldn't use cause it wasn't updated. Thanks for doing something with this app. I hate paying for cooking apps when I can only use a fraction of the recipes because I'm a vegetarian. There is none of that worry with this app. A variety of basic and inventive vegetarian recipes with clear instructions and helpful how-to notes (how to prepare leafy green vegetables; how to beat eggs). The recipes I've tried have been fantastic. 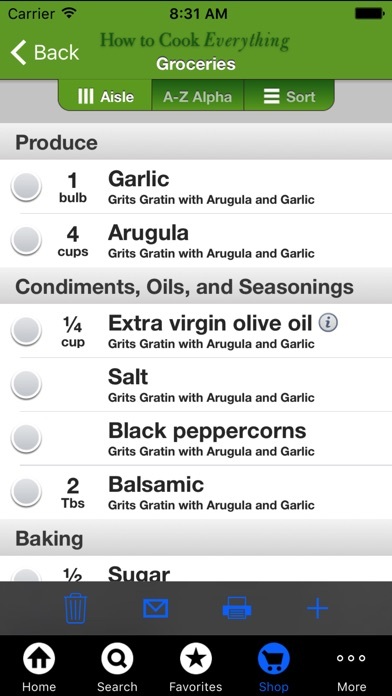 This is such a great app: great recipes, great features (like no-dim and built-in timers and shopping list builders). Totally worth the money. At some point the developers will lose interest in updating this app, and they will then come out with a “new” one that will make the one you bought obsolete. No reason why they couldn’t just update the one you already bought, but what’s the fun (and where’s the profit) in that? They did it with the basic “how to cook everything” app, and I’d be shocked if they don’t do the same with this one. Please update your app to work better with iOS 10+. This is slowing down my iPad. It is a good cookbook, but developer has not updated the app in 3-1/2 years. When opening the app now, a pop-up says that it will not work with the next iOS update, so definitely don't buy it. Buy the hardcover instead. Great ideas on substitutes. Makes eating better fun! Good recipes, very nicely organized. Makes effective use of the iPad format. Definitely worth the cost! This is where I start for great veg ideas. I like some of the recipes in this app but for an app this expensive, I really anticipated at least occasional updates. Can't we get some new menus or recipes from time to time? I bought this app not sure whether I'd actually use it much or not since I don't use a lot of recipes generally when I cook. But I love Mr. Bittman and read him frequently in the Times. And I love this app too! Very user-friendly, well-organized and an easy way to incorporate more vegetarian cooking into your menu choices. Very pleased! The recipes I've tried so far have been delicious. I love Mark Bittman's NYTimes recipe columns and always wanted to buy his How to Cook Everything Book. I'm so glad I procrastinated until it came out in app form. 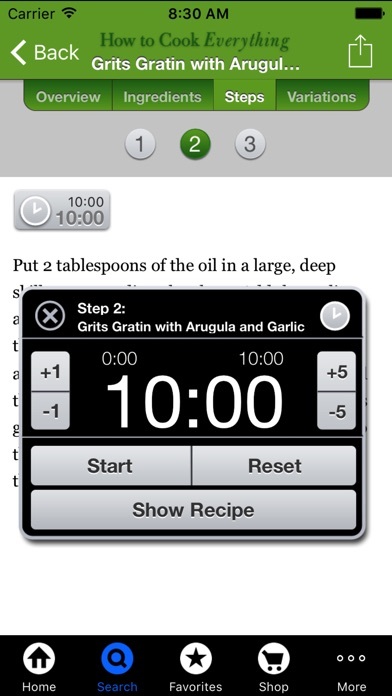 The recipes have his wonderful conversational tone, and I love the tips, the variations, and the built-in timer. Cooking is one of my favorite uses of my iPad and using this app is one of my favorite ways to cook. I love this app but I keep getting told that the developer needs to update this app as it is slowing my phone and iPad down. Please update! This cookbook is great, especially for anyone just switching over to being a vegetarian. The only problem I've had is some of the ratios seem wonky and information can get cryptic. I wish commenting on recipes was an option. Anyone wanting to cook vegetarian could consider this book their primer and feel well-informed. I keep this book handy in my kitchen. While the physical book is a must-have, this app is the perfect companion. It makes the text a living document, and the app also offers functionality that makes it both a useful tool while planning your shopping and preparing meals. I also enjoy the recipe spotlights on Mondays. This app has been completely abandoned. When I open it, I get warnings from Apple because No one can be bothered to update the thing. Ugh. 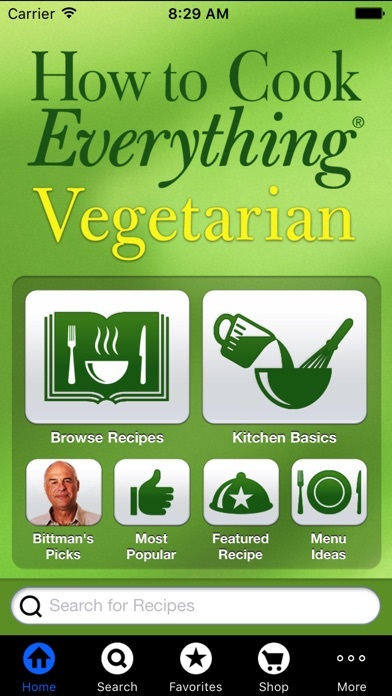 What a great app with such a wide variety of vegetarian dishes. Great pictures, easy to follow instructions and easy shopping cart lists makes it easy. Many of the recipes are quite simple but have great results. Haven't found one yet that isn't a hit. Also love the variations it gives. No use in purchasing, it'll be gone soon. This app is full of good ideas, and a pleasure to use. Thank you, Mark Bittman! This app is nothing but a confusing cookbook. It's hard to get around in it, it's got symbols that are not explained, and it has very limited menus and featured recipes. I don't get why it's getting rated so high. Does anyone know what fmve is? I haven't figured it out. Does anyone care about the opening where it shows pictures of the author with statements about cooking? Is this really supposed to be helpful? I don't get why this is getting such high ratings. I thought it would give menus and recipes to go with them. I at least thought it would give the book, as it says it does. It might, but good luck getting around in it. If I have better luck later, I'll update this, if I can. Right now, I'm saying I don't like it at all. Just go by an e cookbook. It'd be a lot better. This app is just ok. The recipes seem uninspired. I think Bittman tries to keep them simple so they are easy but nothing in this is fabulous. Disappointing. If you want to add vegetarian dishes to your repertoire, get this. I have the hard cover edition of this, but use the app most. It is easy to navigate. It is not exactly like the hardcover, but is easy to use. The recipes can be printed. Most recipes are "templates" that give you ideas for how to adapt a recipe for your tastes and preferences. If you are looking for a book that gives recipes to follow exactly as written this might not be the one for you. If you are looking for good basic information and recipes that are a starting point this is it. Recipes can be followed exactly, but are more useful as starting points. This is a good app when away from home and in a rental kitchen and good to have on your phone at the farmers market! Recipes can also be emailed. I love having this on hand. Great recipes! Where is the new version??? This app is amazing!!! But we need the new version because it is no longer supported in the iPhone (that's why I'm rating with three starts instead of five). Please bring the new version!!!!!! Great recipes! Super easy interface! Keep them coming Mark! I have been a big fan of this app and it's non-vegetarian counterpart. For a while it's felt like they haven't kept up with the features offered in other cooking apps, though. Now, when I launch it, I see a warning that it may slow down my iPad because the app needs updating. So it's not just me: it needs an update. Still has good recipes and instruction. Interface isn't bad. The whole thing just needs some polish. I like this and not a vegetarian. So many inspiring, fresh ideas. I have many vegetarian cookbooks -- love 'em all -- and this one really adds to the collection. I love this app: well-organized, excellent recipes, common-sense practical approach, interesting and unexpected approaches. It's empowering for a new cook, and surprisingly instructive for an experienced cook. Lots of ways to come across interesting things to eat. Making me repurchase? Not cool! Of the 100’s of cookbooks I have, to all the wonderful authors, I need to have a simple way to find delicious, easy to follow recipes at my disposal. I can always count on the recipes in NYT Cooking to be wonderful.